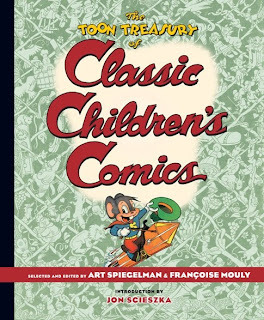 I spent a good chunk of this weekend reading The Toon Treasury of Classic Children's Comics from Art Spiegelman and Françoise Mouly. I originally thought it would mostly be a fun-filled romp through some old comic stories that were originally aimed squarely at kids. Which it was, but it was a lot more than that too. When I first scanned through the book, I saw reprints from Little Lulu, Captain Marvel, Sugar & Spike, Pogo, Nutsy Squirrel and a number of seemingly random characters I hadn't seen or heard of before. I started reading through them, and what first struck me was how amazingly well printed the book is. The reproductions themselves are phenomenal, and they're printed on a slightly off-white heavier stock that, while is decidedly of a higher quality than newsprint, gives the visual impression of reading a half-century old comic with a slight yellowing of the paper. Unlike other attempts I've seen to "age" the paper by printing a pale yellow color onto white paper, this uses a paper that's already been dyed slightly, giving that somewhat muted effect to what would otherwise be a garish color palette. Then, maybe about six or eight stories into the book, I began seeing a pattern in the comics being reprinted. Namely, they were all really great comics! I mean, that sounds kind of obvious on the face of it, but they really seemed to have chosen some incredible material and not just whatever happened to be most conveniently available. There were several beautiful non-Pogo stories by Walt Kelly. The Sheldon Mayer pieces were refreshingly original, especially in light of their having been written so long ago. Carl Barks, as always, does some impressive work. You know, I've read a number of Captain Marvel stories before, but I never really understood why he was so popular. Granted, I hadn't looked at the the whole oeuvre, but I didn't see anything all that special about them. But if "Captain Marvel in the Land of Surrealism" is at all indicative of what I haven't seen, then I totally get it now. And then there's André LeBlanc with his "Intellectual Amos" stories? Why have I never seen those before?!? Holy cow! Those were some of the most gorgeous comics I've seen this side of Walt Kelly! Not to mention incredibly well-written. There doesn't seem to be much about either of them online, but here are a couple sample stories (not particularly well-reproduced, sadly) to whet your appetites! And here's a short bio of LeBlanc for those further interested. Wow -- I really need to track down some more of these! And I think that's one of the greatest strengths of Toon Treasury: that you're almost certain to find something interesting and wonderful that will make you want to track down more Golden Age comics. The ones presented here, as I said, are all exceptionally well chosen, and their reproduction is of such high quality that it's hard not to fall in love with something here. It's not a small book, or a cheap one, but it's well worth checking out. It certainly ranks up there as one of the best Golden Age reprint books I've ever seen. Just read land of surrealism last night and I was floored! Cool stuff! Toon Treasury has exceeded my expectations.